A flight dispatcher is essentially a “non-flying pilot.” The dispatcher plans flights and flight routes, determines aircraft performance and loading, and constantly updates this information given enroute winds, thunderstorm and turbulence forecasts, airspace restrictions, and airport and air traffic conditions. Dispatchers also provide flight following for several flights at a time and work directly with flight crews in real-time to make flight plan changes and deal with emergency situations, should they occur. What are the differences between your credit and non-credit programs? By definition, credit programs allow students to earn college credit toward obtaining a degree. Non-credit programs lead to certification or continuing education, but do not culminate in earning a degree. Unlike credit programs, traditional financial aid cannot be used in non-credit programs. Can I obtain college credit for holding an FAA Aircraft Dispatcher Certificate? Students who hold an FAA Aircraft Dispatcher Certificate can articulate the training required for that certification toward college credit in the following Aerospace degree programs. Specific credit articulation can be discussed with the Aerospace program staff. What are the training requirements to become a pilot? Each pilot certificate and rating has different training requirements, both in terms of minimum hours of experience you must obtain and in terms of tasks you must complete. For more information on the process of becoming a pilot, visit http://www.faa.gov/pilots/become/. Where can I obtain an FAA Medical Certificate? You can obtain an FAA Medical Certificate from designated Aviation Medical Examiners (AMEs). The complete listing of available AMEs can be found at http://www.faa.gov/pilots/amelocator. Bear in mind that all flight students must obtain an FAA medical certificate prior to beginning flight training at Polk State College. What kinds of airplanes and simulators do you use? The Polk State College Aerospace Program, through its flight training provider, operates various aircraft from single-engine, four-seat aircraft to complex multi-engine airplanes. Polk State Aerospace incorporates training in both state-of-the-art Garmin G1000 glass cockpit displays and with conventional “round gauge” instrumentation. We heavily utilize flight simulation technology because of its incredible teaching potential and low cost. Students will train in FAA-approved aviation training devices for loggable flight time, and they also have on-campus access to a host of simulation products that enhance their knowledge and skill and no additional cost to them. Who provides flight training service for the program? Polk State Aerospace utilizes the partnership of a flight training provider. This provider offers structured training as part of the approved Polk State Aerospace training curriculum. All training is overseen by Polk State Aerospace staff, and staff regularly conduct observation flights with program students to ensure the highest level of flight proficiency and skill. Can I get college credit for the pilot certificates/ratings I already hold? Yes. If you currently hold an FAA pilot certificate, you are eligible to receive appropriate college credit for Polk State College courses that correspond to the certificate(s)/rating(s) you hold. In order to be awarded that credit, you must participate in and successfully complete a Certificated Student Assessment (CSA) with the Program Director, Program Coordinator, or an authorized staff member. Note: This is a non-lab activity. The CSA must be completed outside of scheduled flight lab times, and a student cannot enroll in an advanced flight lab until the CSA is successfully completed. If it is determined that you do not meet the minimum pilot standards in place at Polk State College, you will be assigned to a flight instructor for remedial training until such time as you can complete the CSA. Because this is a non-lab activity, financial aid monies may not be applied for use, depending on the type of financial aid you receive. There are some exceptions to the requirement for completing a CSA. Incoming students with prior flight experience and pilot certification are encouraged to review the college’s policy on articulating credit for pilot certificates. There are separate policies for students who hold only an FAA Private Pilot Certificate and for students who hold advanced certificates and ratings above the Private Pilot level. Further questions on the CSA process can be addressed with the Program Director or Program Coordinator. Can I transfer my college credit to and/or from Polk State College? Yes, Polk State College uses an established curriculum approved by the Department of Education for the State of Florida. You may transfer to Polk State College or transfer to another state college and take your accumulated credits with you. In some cases, placement tests or other evaluations may be necessary. Please consult the program director or an academic advisor for more information on credit transfers. Your courses do not look like other collegiate aviation courses. Why is that? 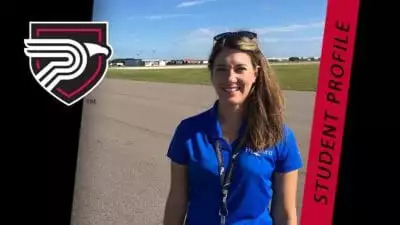 The Polk State Aerospace approach to pilot training is completely different than any other collegiate aviation program you will encounter. Rather than focus on the traditional, maneuver-based flight training model, our program uses a human factors training methodology, similar to what you will find in place in commercial airline training. Every element of every class and flight lab is 100% practical education, whether lecture, group study, simulation practice, or actual flight training. We rely heavily on simulation to keep costs low while exposing our students to situations that you could never safely demonstrate in the airplane. Our program is different because it employs the latest flight training methods to engage students in learning while emphasizing technical proficiency and pilot safety. Similarly, when it comes to our other non-flight program offerings, Polk State Aerospace believes in a practical, “outside-the-box” approach to learning. While the classroom is a perfectly acceptable learning environment, we believe in learning that promotes a more hands-on approach. We accomplish this through outstanding guest speakers from many segments within the aerospace industry and multiple field trips to industry sites. We also encourage all of our students to engage in industry internships, as this is the most practical type of experience one can hope for, while enrolled in the collegiate program. Why should I attend the Polk State College program instead of any other college program? Our program is modern, fresh, and engaging. Every element of every class and flight lab will engage your mind, teaching you skills and knowledge while, more importantly, teaching you a safety mindset that will shape everything you do in the cockpit and outside of it. Our low tuition cost, extensive faculty experience, simulation focus, availability of financial aid opportunities, and much, much more all make the Polk State College Aerospace Program a solid choice for efficient study of the aerospace environment and job placement within it. How much will my flight training cost? Flight training is expensive. There is no way around that fact. We use a reliable, modern fleet of airplanes, state-of-the-art flight simulation equipment, and electronic training media that ease some of the cost burden. Minimum costs for each flight training course are published on the Professional Pilot – About the Program page. Because of the fluctuating cost of fuel and other factors, these prices are subject to change at any time. In addition to flight training costs, students will be required to pay for supplies, equipment, books, and course tuition. Some students will also have to gain additional flight experience outside of conventional pilot training in order to earn enough hours of experience to apply for the commercial pilot certificate. Consult the Financial Aid information page for available benefits for helping defray some or all of the costs associated with flight training and associated expenses. Can I obtain financial aid to cover the cost of my flight training? Yes, you can apply federal grants, government/industry scholarships, federal student loans, or independent loans toward your flight training at Polk State College. Please be aware that the cost of flight training is very high and is not included in the cost of course tuition. Federal student loans and grants will only cover a portion of the total cost of flight training. Students are encouraged to meet with a member of program staff for assistance in planning the cost of attendance prior to enrolling in flight training courses. Contact our Financial Aid department for additional information on available financing options, and consult our program website for many flight training scholarship opportunities, as well as overall program cost. Can I use Veteran’s Administration (VA) benefits to pay for my flight training? Yes, you can apply VA benefits, especially Post-9/11 GI Bill funding, to your flight training at Polk State College. VA benefits will pay for tuition, books, supplies, and flight training costs. Contact our Financial Aid department for additional information on VA benefits and funding options.